The ongoing war in Syria caused an acute degradation in the healthcare sector, according to the World Health Organization for 2016, each one of every two deaths recorded in Syrian hospitals is from cancer. Breast cancer is the third most common disease in Syria and breast cancer in women comes first as the most common type of cancer for women and the highest killer of women in numbers. It is the fifth most common cause of death for all of Syria. Breast cancer is considered a treatable and curable disease if detected and treated in its early stages. 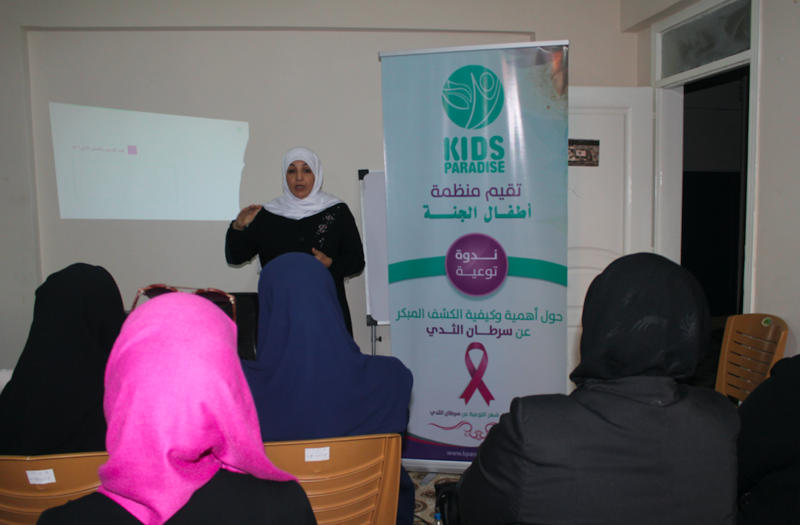 In May 2017, Kids Paradise launched an early detection clinic for breast cancer in rural Idleb with the aspiration to expand to more areas. Prior to opening, our team did an awareness-raising campaign to educate women and young girls on the crucial importance of early detection of cancer and on how to conduct self-checks. Our team visited 27 hospitals, health centres, women clinics and educational institutes. This project was designed as a collaboration between Kids Paradise (KP) and international donors to respond to basic health needs of female IDPs and vulnerable civilians throughout Northern Syria. The project has supported women living in the Idlib countryside through opening a Breast Cancer Early Detection Center as well as holding breast cancer awareness-raising campaigns. Families in all of these areas are now living in precarious and vulnerable situations without any source of income, and with very restricted access to food, health care, and other basic commodities. Breast cancer cases inside Syria have significantly increased in recent years. In addition to this, the severe degradation in healthcare services has made early detection of breast cancer impossible in many cases. According to the World Health Organization for 2017, each one of every two deaths recorded in Syrian hospitals is from cancer. Breast cancer is the third most common disease in Syria and comes first as the most common type of cancer for women and the highest killer of women in numbers. Breast cancer is considered a treatable and curable disease if detected and treated in its early stages. It was with the high prevalence of breast cancer in Syria, and the inaccessibility of diagnosis and treatment that Kids Paradise in collaboration with international donors launched this breast cancer early detection program over a two month period in order to start to fill a critical gap in aid being provided in Syria right now. This project provided early detection of breast cancer for 420 women living in the targeted areas in northern Syria. The project helped increase the probability of full recovery and the chances of survival of 7 women who were diagnosed with varying stages of cancer over the two-month duration of the project. This project aimed to additionally spread awareness amongst the female population on the importance of early detection of cancer and teach the women about suspicious signs and symptoms, causes of cancer, how to perform self-checks and how often to do these checks through pamphlets which were distributed at various locations, a Whatsapp campaign, and emails and seminars which reached an estimated 10,000 women. Through this collaboration Kids Paradise has provided a lifesaving humanitarian assistance to IDP and local women in Syria who have, since the start of the war, had limited access to basic medical facilities. The work plan has been fully accomplished as planned. Other than the challenges listed below, no other challenges were reported from the field team as they applied good coordination in the interior and exterior level making the project run smoothly. Our challenges stemmed not from lack of coordination, but rather from the culture surrounding women’s issues and cancer. During the awareness campaign, we faced some psychological issues with some women who didn’t accept the possibility that they can get cancer. We dealt with this issue by explaining to them how breast cancer is widespread and that 1 of 8 women is diagnosed with cancer in their lifetime. We insisted on the necessity of doing regular examinations in order to save their lives by discovering it at its early stages. The result was that these women were convinced to do regular examinations. We faced another social difficulty as the community in the targeted area didn’t accept the idea of a male specialist explaining to women the steps of self-examination. We resolved this problem by training female staff on how to teach other women about self-examination, and the male doctor only diagnoses the case. The result was that the community accepted the female staff to do the training. Lastly, we faced a difficulty in finding medical centers that can do directed biopsies to identify the type of cancer the patients have or finding medical centers to do surgeries at for the cases that require urgent surgical intervention. We resolved this problem by contracting with a taxi to transport the patients to the hospitals/ medical centers (Bab Al-Hawa hospital in the border areas, a clinic specialized in pathological anatomy in rural Hama) accompanied by the medical specialists to help them move fast towards recovery. Due to the ongoing conflict as well as the mass influx/ high concentration of IDPs that have poured into these areas the socio-economic stability of the area has plummeted both for the IDPs and the host population. This project, in particular, targets internally displaced and host population women equally. Additionally, women are a particularly vulnerable group of the community who are in particular need of support. As such, this project aimed to improve the protection of women and their families, preventing them from exposure to health risks and helping them to understand how they can help themselves and where they can go for help. The breast cancer awareness and early detection center project started on the 1st of May, 2017 and concluded on 30th of June 2017. The project consisted of two major activities. Awareness Campaign: The project started with a big advertisement scheme on social media by sharing educational brochures explaining how to perform self-checks. The campaign lasted about a week and targeted around 4000 women. A team of trained members (Community Health workers) conducted a field awareness campaign that targeted 5 villages with door-­‐to-­‐door visits distributing leaflets that explain the importance of the early detection of cancer and how to perform self-checks. Trained females explained the content of the leaflets for the women and the right way to do self-examinations. Other teams distributed leaflets at medical centers, pharmacies and places where women work like tailoring workshops and women’s activity centers. The campaign went on for 10 days. The total estimated number of women reached with this campaign is 5,000. Meanwhile, the cancer early detection center was holding awareness seminars for women that explained the work of the center and the importance of early detection and how to do self-checks. During the awareness campaigns and seminars, we advised women to come to our early detection center to do further checks especially if they notice any disconcerting signs after doing the self-examination. Doppler ultrasound examinations were done by specialists to determine if the patients have cancer or not. The center welcomed 421 patients from May 20 until July 30, 2017. This period includes the holy month of Ramadan and Eid holiday when people usually prefer to rest and not move a lot. Twenty-three of the patients had worrying results and Kids Paradise helped them get further examinations (Biopsies, Mammography, Pathological diagnosis, previous diagnosis). Seven of these women turned out to have cancer. Kids Paradise referred them to specialized hospitals. 1- Advanced stage four case. The patient had an urgent surgery to remove the primary tumour area then she was referred to Turkey to do palliative chemotherapy. 2- A stage two case. She had a surgery to remove the cancerous mass from her underarm and she will be referred to Turkey to do radiotherapy. 3- A stage two case. She was referred to Turkey after she finished all the medical procedures and papers required to receive the needed chemotherapy and radiotherapy. 4- A stage two case. She was referred to turkey after she finished all the medical procedures and papers required to receive the needed chemotherapy and radiotherapy. 5- A stage three case. She was referred to turkey after she finished all the medical procedures and referrals required to receive the needed chemotherapy and radiotherapy. 6-Two cases who preferred to go to Damascus to complete their files and medical procedures because they have family and relatives there who can stand by them throughout their treatment journey. Kids Paradise is following up on all of the cases referred to Turkey regularly and provides them with logistic support from food, transportation and interrupters to communicate with the Turkish hospitals. Kids Paradise plans, firstly, to continue to support the center for an extra period of time because they believe in the importance of the services the center is providing until they receive the required support for it to keep functioning in the long‐term. Kids Paradise hopes to the project can be further developed by opening a big center, in a large inhabited area, that will be equipped with all of the examination and inspection machines. They also hope to open several small clinics (like the one that has been running for the last two months) in small villages for clinical examination that refers any worrying cases to the main center where they can do all the necessary screenings, inspections and tests. From there, if it was confirmed that the case has cancer they will be referred to specialist hospitals then to Turkey. 2-Doppler Ultrasound machine and film printer. 3-Ultrasound machine to take the biopsy. 4-Directed Xray machine for lungs. Kids Paradise would like to thank everyone who was involved in making this project successful and everyone who participated in raising awareness about this disease that threatens the lives of those who are not informed enough about it. Most importantly, we also would like to thank the donors who have made this distinguished project possible. Kids Paradise in collaboration with donors is aiming to provide a reinforced hospital to increase access to safe health care for the local community. This project will build resilience in the community and offer regular medical training. If confirmed, the hospital will become an important and integrated part of Syria’s health system far beyond the emergency situation in order to provide sustainable and long-term health care for women and children and increase the overall health of the community. Besides the planned hospital project, Kids Paradise also implements small health projects. We distribute hygiene kits and collaborate to provide health awareness enrichment activities for children.